When we remark that a system of education has been doing badly, what exactly do we mean? What are the qualitative traits and quantitative measurements that can estimate the level of efficiency of education of an individual or an age group? Once we recognize what parameters to use and find out where the learning level stands, how can we use this information to improve the system? These are not remote, academic questions concerning only obscure scholars of research in education – they have been part of rather inarticulate worries in the everyday lives of ordinary citizens of India. In spite of many large-scale drives like ‘learning without burden’ or the ‘sarva shikshan abhiyan’, schooling continues to be a chore without clear connection to the immediate experiences of children or their future as responsible, knowledgeable and productive adults. Employers recruiting for jobs that do not need much specialization also find that graduates out of high school or college are not equipped with the knowledge, skills and abilities expected for their age or learning. The level of introspection among us Indians to find the cause and remedy the situation has not been sufficiently deep or satisfactory. Educationists elsewhere in the world have been genuinely worried and have tried both to understand the nature of the problem of education in India and to find solutions that can be immediately implemented. The book Rebirth of education by Lant Pritchett, Professor of the Practice of International Development at the Kennedy School of Government at Harvard University, is a comprehensive effort in this direction. The book examines the root causes of the failure of systems of education in several developing countries, including India. What is more, it outlines the essential traits of a universally good system of education these countries can aspire to achieve, while also elaborating on the change in the mindset of the people and governments required to make this happen. The book begins with establishing the enormity and gravity of the problem by explaining the evidence of poor learning outcomes in several developing countries. Data available about studies on school-age children in India, Pakistan, Ghana, Turkey, Mali, Bangladesh, Tanzania, Philippines, Colombia, Mexico, Brazil and other countries are cited and analyzed to glean the main traits that reveal the nature of poor learning outcomes in these systems of education. Annual Status of Education Report (ASER), by the ASER Centre, New Delhi in collaboration with Pratham, a non-government organization, has been testing almost half a million Indian children every year since 2005 and the book laments about how the results show that things are getting worse. The percentage of grade five students who cannot read a story at the grade two level had been rising in the seven years preceding this book, till 2012. The fraction of students in grade five who cannot do division stayed the same or went up in the same period. 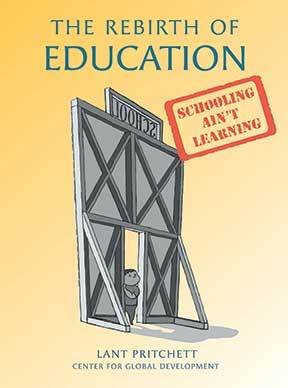 Pritchett emphatically points out the mistake of equating schooling with education. Expecting that if the child has attended school and the teachers have been supplied with required materials and facilities, appropriate educational outcomes are guaranteed is a familiar fallacy. Apart from these, in India we have an additional problem of inadequate teacher preparation. There are two kinds of extreme cases haunting this field – one where even untrained individuals hired on temporary contract seem to perform better in some places, another where even regularly employed, trained teachers fail badly at the same tests given to their students. Both situations argue very strongly for the immediate need for drastic steps to improve pre-service teacher education as well as teacher professional development in the country. The reason why all the effort to provide “inputs”, i.e., the timely and adequate availability of facilities, personnel and materials does not seem to help in improving learning outcomes is quite simple: just ensuring the physical presence of all these does not automatically identify learning goals or monitor whether those goals are achieved. The fallacy of the system has been to assume that since learning is the purpose why schools have been established and children are enrolled, providing the inputs must trigger better results. Unless specific and sensible goals are set and their progress is followed up, we cannot expect the teaching-learning practices to improve. Until the habit of accountability is built in at every stage for all the individuals involved, no concrete outcome can be generated. Merely imitating the current practices of countries where education is doing well won’t do to improve the system in countries that are doing badly. Pritchett explains the thoughts behind this conclusion in the section he calls “Why West does not know best”. He observes that the learning profiles of children in OECD countries have been doing quite well from the 1950s onwards and more interestingly, have almost stagnated at a good state of performance for the last two or three decades. Therefore, comparing the current trends in these countries with those of developing countries does not make any sense because the system of education in OECD countries is not dealing with the same problems as developing countries at all! Even the elderly Western educationists of today were born AFTER the learning profiles started doing well, and therefore have no personal experience of how to improve the profiles in the first place. They might not have been old enough even to watch and understand how the process progressed at that time. This basically leaves it to the educationists in the developing countries to try and come up with their own solutions to the failures of their respective systems of education. When the public schooling systems work in the fashion of spider organizations, and learning outcomes are not good, the root of the problem remains intractable due to the top-down manner in which the system functions. To overcome this, Pritchett recommends evolving starfish type of organizations where each independent unit is free to function uniquely, its effectiveness is objectively evaluated, resulting in only successful units being allowed to continue or scale up. In practice, this calls for a strategy similar to evolution of life forms: many types of schools run by different ‘proprietors’ are allowed to function simultaneously; their effectiveness is assessed thoroughly and the results made public; students/parents/guardians are given a flexible choice to move between schools; objective criteria are set for eliminating badly performing schools that fail to attract reasonable number of students; successful schools are analyzed to understand their qualities and suitable types are scaled up. This strategy stands to reason, but it is also important to realize why such a simple mechanism has not been operating in reality, as explained below. Pritchett reminds us of the historical reason why most governments adopt centralized systems of education, which no longer needs to be that way in modern societies: when nations in the contemporary sense of the term came into being, governments needed to shape the ideology of the upcoming generation of citizens. Hence, it was useful, nay necessary, to make public schooling unified and uniform. As inculcation of beliefs cannot be contracted to a third party, the governments had to keep a centralized hold on the system of education. Pritchett touches upon the different types of origin and spread of public schooling in several countries – Japan, Netherlands, Belgium, France and Turkey. In spider type of organizations, centralized and badly functioning system of education has resulted in ‘value subtracting and rent-extracting’ schools that do more harm in terms of both wasting resources and not delivering any learning to students. Such systems have another dangerous trait: that of concealing their defects by superficially managing to mimic better systems. This camouflage results in the loss of accountability at all stages, held in place by rigid hierarchical structures. To help in building the framework of moving from ‘spider’ systems to ‘starfish’ systems, Pritchett identifies six traits of an effective starfish ecosystem, as listed below. In the context of education, if the system of education either already displays or strives to acquire these traits, it can hope to do really well in terms of educating students. Open: How is the entry and exit of providers of schooling structured? Locally operated: Do those who manage schools and teach in schools (and the local coalitions of parents and citizens they are accountable to) have autonomy over how their school is operated? Performance pressured: Are there clear, measured, achievable outcome metrics against which the performance of schools can be assessed? Professionally networked: Do teachers feel a common professional ethos and linkages among themselves as professional educators? Technically supported: Are the schools, principals, and teachers given access to the technical support they need to expand their own capacities? Flexibly financed: Can resources flow naturally (without top-down decision-making) into those schools and activities within schools that have proved to be effective? Another set of criteria that differentiate starfish systems from spider systems is the way in which responsibilities are allocated, as listed in the table below. It is worth mulling over what the current distribution of functions in the following table is in the Indian system of education and what we would like it to be in the near future. Pritchett narrates the examples of three successful, yet unique systems of education to inspire the efforts of developing countries: Western (mainly American) higher education, the International Buccalaureate schools and recent developments in education in Brazil. From the discussions in the book two concepts radically different from the current system of education in India emerge, which may help to alleviate many problems being faced by the system at present. These are, (a) evidence-based decision-making to identify best practices and successful schools (b) space for and evaluation of disruptive innovation. Given that a new National Policy of Education is being formulated at the moment, we can hope that these pragmatic yet costless measures are incorporated into the system and their proper implementation gives us the desired improvement in education. Bold, Tessa, Mwangi Kimenyi, Germano Mwabu, and Justin Sandefur. 2011. “Does Abolishing School Fees Reduce School Quality? Evidence from Kenya.” CSAE Working Paper WPS/2011-04. Centre for the Study of African Economies, Oxford University. The author has been a researcher in biology and an educator, taught at the undergraduate programme of IISc from its beginning; now freelancing as an independent advisor to academic institutes and teaching faculty. She can be reached at ysushama@gmail.com.